Are your teeth badly stained, slightly crooked, or unevenly spaced? If so, porcelain veneers from your cosmetic dentist at Dowd Family Dentistry in Fayetteville may be the perfect solution for you! Read on to learn all about this fantastic dental device and how it can help you achieve the beautiful smile you've always wanted. Porcelain veneers are thin, tooth-shaped porcelain shells that are attached directly to the front of your teeth. 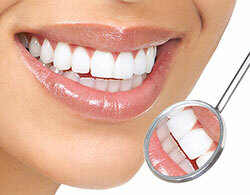 Veneers look and feel completely natural, and they can be used to cover or disguise a number of dental imperfections. What Dental Problems Can Porcelain Veneers Be Used to Fix? Most dental devices are only designed to repair a single dental problem. Porcelain veneers, on the other hand, can simultaneously fix a wide number of dental problems, giving you teeth you can be proud to show off. Tooth Discoloration: If your teeth are badly discolored and all of the tooth whitening treatments you've tried simply aren't helping, cover them up! Veneers sit right on top of your existing teeth, hiding any discoloration so your teeth always look brilliant. Gapped or Crooked Teeth: If your teeth are gapped or crooked, don't spend several months and hundreds of dollars on painful and unsightly braces to correct them. Veneers fill in the missing spaces to make your teeth perfectly aligned once again. Unnatural Tooth Shape: If your canines are pointy and awkward, you don't just have to live with it. Your Fayetteville cosmetic dentist can create a custom tooth shape that will look perfect on you. Chipped or Broken Teeth: If your teeth are chipped or broken, the result isn't just unsightly, it can also put your oral health at risk as well. Stabilize your teeth and improve your appearance with porcelain veneers from Dowd Family Dentistry. Are you ready to say goodbye to your awkward, discolored or unsightly smile and say hello to a picture perfect smile you'll be proud to call your own? If so, porcelain veneers from Dowd Family Dentistry in Fayetteville may be just right for you. Only a dentist can let you know for sure, however, so go ahead and call your favorite cosmetic dentist and set up an appointment today. Your beautiful new smile may be closer than you know!